Lulled by the rhythm of the ocean waves and the legendof Hiro, the giant demigod of thieves who cut the island in two with his canoe, Huahine-Nui (the big island), and Huahine-Iti, (the small island), lie dormant on a bed of coral. Huahine, also called “the Woman Island”, overflows with a savage allure that makes her exceptionally attractive: her velvet slopes draped in exuberant tropical vegetation, her mirror-like lagoon reflecting the phosphorescent coral formations that lay scattered in their silent abode and her numerous snowy white sand beaches that envelope her in virginal modesty. It takes three and a half hours to go around the island, a mystical tour due to a tormented relief. Rich in archaeological relics such as traditional dwellings and “maraes” (traditional temples built in honour of the polynesian gods), the island still vibrates from a mysterious past. A visit to the temple of Orohaehae or of the sacred lake of the ancient wizard kings is a wonderful occasion for the visitor to experience the untouched and enchanting authenticity of Huahine. 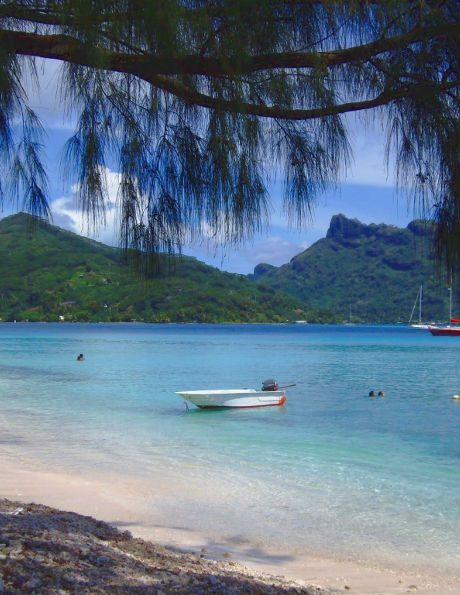 Fare, the main village located on Huahine-Nui and rooted in ancient Polynesian lifestyle, looks asleep in the shade of “badamier” (local chestnut tree) and acacia trees, awakening upon the arrival of cruiseships and cargo-schooners from Papeete. The inhabitants welcome visitors as they experience the aromas of vanilla, coconuts, bananas, watermelons and even melons, while fresh colorful fish from the lagoon hang from the trees. Wild and enticing nature: luxuriant vegetation, untouchedbeaches, deserted coves, idyllic “motus” (islets), abundant fruit trees and colorful enchanted lagoons these are the sorts of features available on this island. Like all of the Society Islands, Huahine has a beautiful lagoon surrounding a lush green interior, but the most unique thing to discover here is the Village of Maeva; home to the largest concentration of archaeological sites in the Pacific. If you're looking to learn more about Polynesia, including the fascinating history and culture of this stunning "Garden Island," then this is the perfect tour for you. 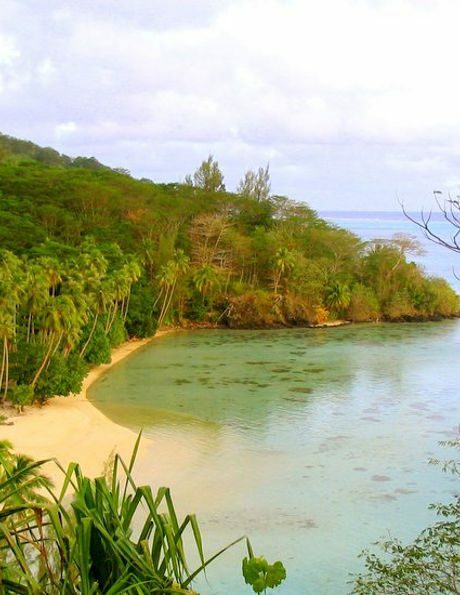 WHAT YOU WILL VISIT: Archaeological Sites of Maeva Village, Fare Potee Museum (includes admission fee), Vanilla Plantation, Fish Traps, Beach on Motu Maeva, Giant Blue Eyed Eels, Belvedere View Point, Maroe Bay and Huahine Iti. WHAT YOU WILL SEE: 2 Islands, 8 Villages, Plantations, Mountains, Vistas, Valleys, Lagoons, Motus, Flora and Fauna. WHAT YOU CAN PURCHASE: Vanilla Plantation: Various Vanilla Products / Fare Pote'e Museum: Local Handicrafts. Climb aboard a comfortable traditional outrigger canoe for a whole tour of the island. Parka and Armando will share the island's history, it's sacred legends and give you an insight into daily island life. You'll then enjoy a delectable picnic on a beautiful beach. You may explore the breathtaking underwater coral gardens, full of fish and other aquatic life. Chances are that during this tour of the island's lagoon you will very probably encounter one of the water's most often found inhabitants: the black tipped shark. You will skirt along under the mythical cliffs of Maroe Bay, around which legends abound, listening to some of the traditional stories that are told by your hosts on your way back to your hotel. Claude & Martine welcome you onboard their comfortable 50 feet monohull sailboat for a full day sailing cruise and snorkeling spots on the west part of the lagoon of Huahine. 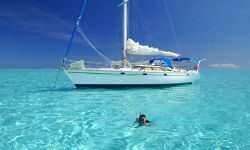 In the morning, the sailboat will be anchored close to the reef barrier for your first snorkeling : you will discover different colored corals in very good shape.You will continue the sailing southwards until the Avea Bay. After lunch served onboard, it is time to enjoy the pleasure of your yacht : swimming, sunbathing on the deck. You will also look for sting rays and leopard rays with their 15 HP dinghy. Then, Sailing with the fair wind, you will sail to the Hana Iti Bay (one of the most beautiful beach we've ever seen at easyTahiti.com!!) where you will anchor in front of a lovely white sand beach accessible only by sea. 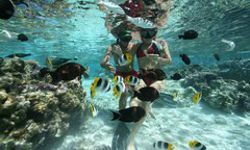 You will snorkel at the coral garden of the motu Vaiorea and be able to observe different species of colored lagoon fishes. Still sailing with the fair wind you will reach the Quay of Fare by 5 pm. Have you ever wanted to get up close and personal with exotic marine life but still stay completely safe? There is a very special place set up where you can do exactly that! The choice is yours to either watch the animals from an observation platform, or you can be a little more daring and descend into their underwater world for a close-up encounter. Professional guides will accompany you every step of the way into the shallow lagoon waters and you will be able to experience this unique activity knowing that you’re well protected on all sides. Huahine's dive sites are less discovered than other islands and present a quiet underwater world perfect for beginning and intermediate divers. Sites feature yellow coral gardens and concentrations of reef fish, eagle rays, tuna, and grey reef sharks. Bicycle rentals for flat rides on the lightly-traveled roads. Snorkeling at the many quiet beaches. For expert surfers, the passes are world famous. Belvedere lookout on Mount Turi overlooking Maroe Bay. The blue-eyed eels of Faie. Ancient fish traps of Lake Fauna Nui. Vanilla plantations and fruit gardens along the road on both islands. 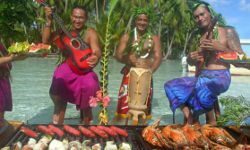 The resort restaurants are among the best in the Pacific and feature lavish and traditional Polynesian shows and music performed by the island's best musicians. 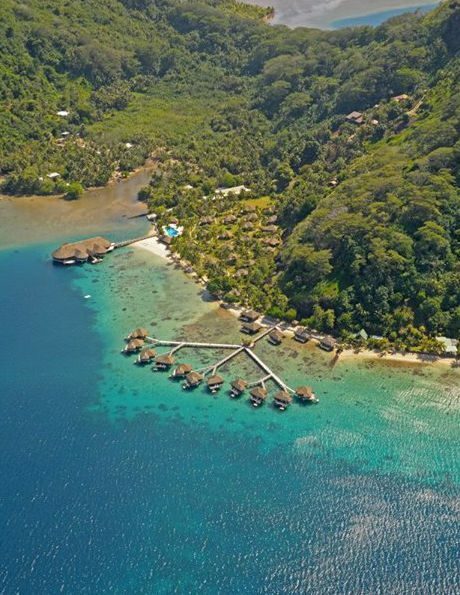 You can try the restaurants of the Hotel Maitai located next to Fare Town or the one of the Relais Mahana offering a charming local atmosphere of the isolated southern island. Try also the few roulottes and snack shops perfect for informal settings and picnics. 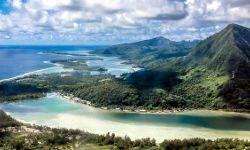 Huahine is served by Air Tahiti with frequent 35-minute flights from Papeete, daily flights from Moorea, and 20-minute flights from both Raiatea and Bora Bora. The airport is a 15-minute drive from the main village of Fare. Transport from the airport to the hotels will be reserved by your travel advisor at easyTahiti.com.